The momentum of a mortgage purchase is growing on eligible first-time home buyers and current homeowners who are searching for a 30-year and 15-year rates or looking to refinance their existing mortgage rates. VA mortgage interest rates are steadily dropping even lower according to Ellie Mae. Today’s mortgage interest rates are making FHA and VA loans a lot more favorable when compared with Conventional, Freddie Mac and Fannie Mae loans. Ellie Mae’s Monthly Loan Origination Insight Report for August also indicates that VA rates are the lowest rates of all mortgage loan types available today. VA interest rates are steadily dropping despite today’s economic health. With rates lower than all other loan types available, eligible military borrowers looking to purchase a mortgage should definitely consider the VA Guaranty Loan Program. For borrowers who are VA eligible, now is the time to either purchase or refinance a mortgage. Ellie Mae’s Origination Insight Report for September shows an average closing of VA loans to be more than 37.5 basis points lower than closed Conventional loans when compared between the two loan types. The average rate VA loans closed at was 4.12%. 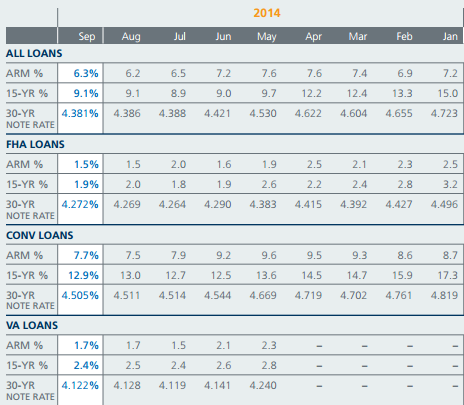 Ellie Mae provides origination insight overview for all loans closed in August and September. VA shares spotlight with FHA. FHA loans averaged a 4.27% nationwide in September. Both mortgage loan programs have got the rest beat. FHA has Conventional beat by a quarter percent. The only downfall for FHA’s borrowers is the requirement of its annual mortgage insurance premiums also known as an MIP. 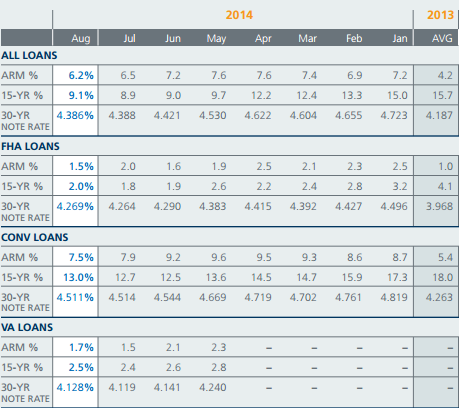 Conventional rates are highest of all loan types today with an average of 4.51% in September. This is a difference of a one-eighth percentage higher than the average percent for all loans closed. The VA Guaranty Loan Program has been in existence for 70 years now and has helped millions of veterans nationwide in becoming homeowners. The VA encourages all VA-approved lenders to help those who serve the great nation. These low interest rates today benefit more so for VA eligible borrowers. The VA loan Guaranty Program backed by the Department of Veterans Affairs gives veterans and all eligible military members the option to refinance or purchase at the most affordable rate. The program is also backed by VA in the event that a loans falls into default, in which case the borrower is guaranteed to have the VA repay back a portion of that loan. This is one of the many reasons why lower rates are offered for this loan type. Additionally, to top off benefits of low rates for VA borrowers, there is also a no down payment and 100% financing advantage as well. Also, unlike the FHA, there is no mortgage insurance required either. All VA home loans are assumable as well, meaning that if the homeowner chooses to sell their home, it can be assumed by another VA eligible borrower. Even better, if the eligible borrower decides to take over the mortgage, they can take advantage of the prior homeowner’s already purchased interest rate, regardless of possible increasing rate trends. The VA Loan Guaranty Program also provides its borrowers the option to refinance under VA through the VA Streamline Refinance Program (IRRRL) which is also one of the most simple and quickest ways to refinance a mortgage with lenient underwriting guidelines. All mortgage loan programs may be experiencing low rates today, but in addition to this trend, the VA just has more benefits to offer its borrowers.